If you’ve ever been interested in bike racks for cars, but didn’t know where to start in your research, then you’ve come to the right place. Throughout this guide, we’ll take a look at some of the key characteristics of a high quality bike rack, and specifically talk about some of the best examples currently in the market. 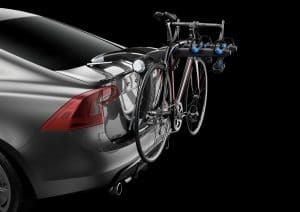 With this guide, you’ll be able to tell at a glance what some of the biggest pros and cons are of the most popular bike racks for cars out there. 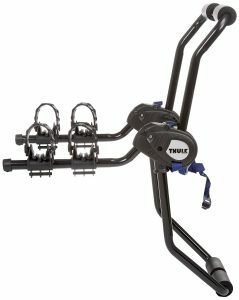 Description: While the Thule Raceway Mount Bike Rack may seem expensive at first glance, it more than makes up for this with its wide range of features that make it well worth the cost. Specifically, its secure fastening ratcheting cables ensure that it does exactly what all bike racks for cars are supposed to do: keep their package secure. Pros: As mentioned, the secure fastening ratcheting cables are one of the biggest improvements that this model has over its competitors. I personally know that I can trust my Thule Raceway Mount Bike Rack when other models might not instill the same level of confidence. Equally important is its rubber mold that protects both the bike and the car from unnecessary scratches. 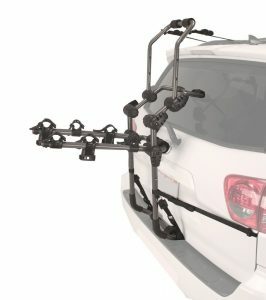 If you’re concerned with keeping your bike and car in top shape, then the Thule Raceway Mount Bike Rack is for you. Cons: Of course, as effective as the Thule Raceway Mount Bike Rack is, it also comes with a somewhat steeper price than some people might be expecting for a bike rack. 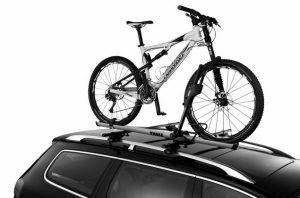 Bike racks for cars come in a fairly wide price range, so if the Thule Raceway Mount Bike Rack is too expensive for you, then you should be able to find something a little more affordable. 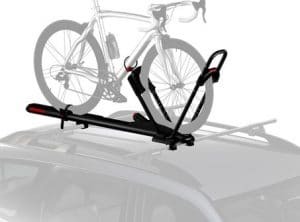 Description: Another in the Thule brand line, this bike rack is a remarkably compact product that allows itself to be easily transported between destinations. In addition, it doesn’t prevent rear vehicle access like some other models, ensuring that you can always access your trunk when you need to. If you’ve ever dealt with the frustration of an uncooperative bike rack, then you’ll want to take a serious look at this model. Pros: The Thule Classic Bike Rack’s greatest benefit is its efficiency. This bike rack sets up quickly and easily and can be taken apart just as fast. Cons: As with the previous model, this one is on the more expensive side, which may not be to some people’s liking. Description: Unlike the other Thule models we’ve looked at, this one attaches to the roof of your car instead of the rear. 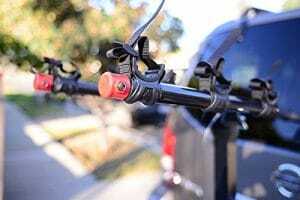 In addition, the Sidearm Mount has multiple attach points, allowing more than one bike to effortlessly attach to the top of the car for group outings. Pros: Designed for ease of use and group utility, this model is perfect for anyone that regularly goes out biking with friends or family. Cons: For those that are paranoid about security, this model may not seem as tight or secure as others that are slightly more expensive. 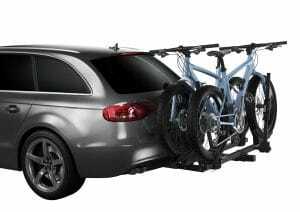 Description: The Yakima Products Tray Style Bike Rack is similar to the Thule Sidearm Mount in that it is also designed for group excursions. Depending on your price range, it can support anywhere between two and four bikes simultaneously. Pros: The biggest benefit to the Tray Style is that it supports so many bikes at once, even if it involves spending a little more money. Cons: Aside from spending more money for greater functionality, there aren’t really any negatives to the Tray Style Bike Rack. Description: Known for its unique arc design, the Vertex Mount Bike Carrier is perfect for cyclists that want an incredibly secure model that can be quickly stored away when it’s not in use. 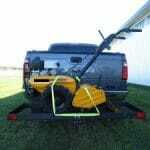 Pros: For its comparatively low cost, the Hitch Mount Bike Carrier can carry up to four bikes simultaneously. Best of all, it’s in the medium price range for most bike racks for cars, ensuring a high level of quality. Cons: Some women’s bikes may not be angled properly with this model, requiring a bike adapter to work properly. 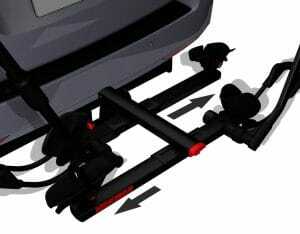 Description: The Hollywood Mounted Bike Rack is an easily adjustable rack that is already set up right out of the box. It carries up to three bikes and has built in technology to reduce bike sway while on the road. Pros: The fact that this model comes pre-assembled should be considered a godsend to those that hate putting things together themselves. We understand that pain all too well. Cons: Unlike some other models at a similar price point, this rack can only carry up to three bikes instead of four. 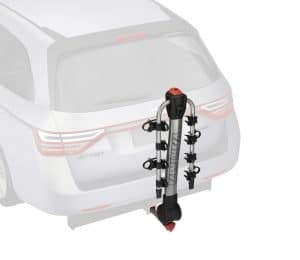 Description: The Yakima Products Hitch Bike Rack comes with a quick speedknob that helps cyclists easily lock the rack into place on any vehicle. In addition, it can be folded flat for quick and easy storage. Pros: The biggest benefit to this bike rack is in its cost. While it has a middle price point, there are several variations of the model that can hold between two and five bikes. Cons: While it theoretically can hold up to five bikes, there are a number of issues that develop if you’re not careful. If you have experience in bike racks for cars though, this shouldn’t be too much of a problem. Description: This 3 bike rack uses Allen’s patented system to securely tie down bikes and ensure that they’ll be ready to go when you’ve reached your destination. Pros: With its innovative fastening technology, this model is perfect for cyclists that are seriously concerned with their bike’s security. Cons: The biggest limiting factor for this model is probably its trailer hitch requirement to be properly installed. 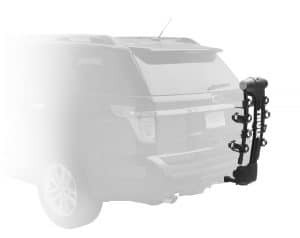 Description: The Thule Passage Truck Mount Carrier is perfect for cyclists that are worried about scratches on both their bike and their car. 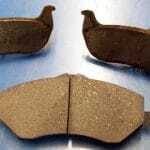 Through its anti-sway cages and rubber pads, it protects both at a much cheaper cost than the other models on this list. Pros: As mentioned, the biggest benefit to this model is its comparatively low cost and focus on scratch protection. Cons: Its low cost may be prohibitive to those that want to spend more money for a higher quality item. Description: The Yakima HighRoller Rooftop Bike Rack is perfect for solo cyclists that just want to take their bike out for a quick trip. Those that are used to removing their front wheel will be pleased to know that you don’t need to do that with this Rooftop Bike Rack. Pros: With a relatively low cost and excellent features for a solo cyclist, this is perfect for anyone that doesn’t want to waste a lot of time installing or maintaining a bike rack. Cons: While it’s great for a solo cyclist, it doesn’t provide a lot of options for groups of people.